Reflections of the ferry in the harbour water at Lindau. 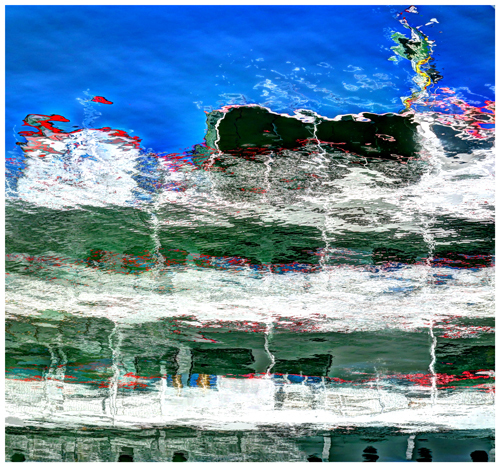 The boat is recognisable but looks different from every angle and is constantly changing with the rippling surface. Context was also unusual – the day was very warm despite the November month, the blue sky reflected clearly in the water while the coloured highlights on the boat brighten the upper and lower decks. Stopping to take in the view, considering how to frame the photograph, working the digital photo editing and finally deciding how to publish the image all required reflection time. This time, if not taken, would not have resulted in the existence of something new, something different, may I say something worthwhile. It is with this “time for reflection” mindset, normally referred to as retrospective in an agile context, that improvements to the current process are enabled. Time is taken by the Scrum Team to determine what worked well in the last interation, what they should continue doing and what needs to stop. This is facilitated by the Scrum Master with the focus on process improvement in an environment that encourages open exchange of ideas and facts as perceived by the individual team members. Everyone is encouraged to participate fully and to provide feedback in a direct, although constructive manner. You will also come across the idea of retrospective in a Kanban environment as additional time set aside to extend the effectiveness of the integral continuous improvement philosophy Kanban already brings. Why do an additional retrospective then you may ask? An additional timebox focused specifically on process improvement provides further discipline and brings the team together at the same time into a continuous improvement mindset. This has benefits as the whole team is then engaged in viewing the whole process at the same time. I recently started using a personal kanban for managing my out of work backlog. Here the idea in my case as a “team of one” is to run an introspective each week on the activities completed to look for ways to improve productivity, effectiveness and efficiency when considering the completed tasks that have arrived at “done” in my personal kanban board.